Serving the most needy people in our community is a big mission that requires a central location big enough for our ministry and equipped with a kitchen, offices, and a room for meetings and lunch. After months of searching we found the perfect spot. The old Lombard Restaurant at N 14th Street. It has a well equipped commercial kitchen and plenty of space for all of the work we envision. Plus it is located in the center of town and accessible by all who would benefit from our services. Art Lenzini and Pete Bondioli owned the building and were excited about our dream of making it a hub for community help and volunteerism, so they worked with us to turn it into the new home for the Herrin House of Hope..
We closed on the building in December of 2012 and opened our doors to serve the needy of Herrin in September of 2013. 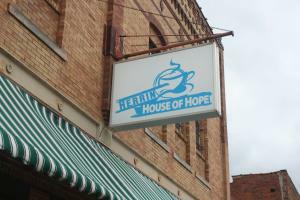 The Herrin House of Hope Thrift Store was officially opened in the Fall of 2014 and provides low cost clothing and other essential items to those in need. Lunch is served Monday through Friday from 11:00 am to 1:00 pm and the Thrift Store is open each day from 11 to 2.
were Served @ "the House!"